If you consider adopting Big Data Analytics, you are among the future leaders in your domain. 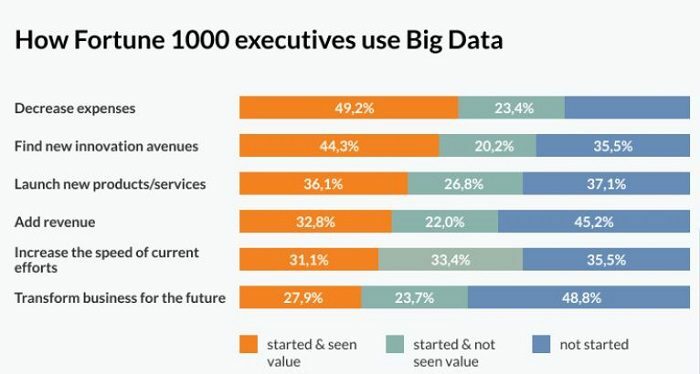 IDC predicts that worldwide revenues for big data and business analytics will amount to more than $203 billion in 2020, at a compound annual growth rate (CAGR) of 11.7%. identifying the causes of failures and problems in real time. Due to quantitative nature, Financial Services and Fintech are a perfect fit for Data Science, Machine Learning, and Big Data analytics. There are many open-source machine learning algorithms and tools that are compatible with financial data and help to produce actionable and accurate insights. Also, renowned financial services companies have deep pockets and can afford to spend a lot on state-of-the-art computing equipment. For example, banks and financial institutions can leverage this technology to monitor thousands of transaction parameters for every account in real time. The algorithm assesses each action a cardholder takes and defines if an attempted activity is characteristic of that particular user. Such model flags signs of fraudulent behavior quite accurately. Banks and insurance companies have a vast amount of historical consumer data, so they can apply Data Science models to these big datasets. Also, they can use data generated by large telecom or utility companies. As a result, if a person has a thin credit history, they can obtain the payment probability score. Other cases include portfolio management, predicting ATM failures, and more. By analyzing logs and previous customer behaviour e-commerce businesses can achieve more targeted and personalized marketing and thus boost sales and performance. Another important aspect is managing stocks and predicting products in demand. It helps to keep track of stock levels, determine costs for shipping and storing, identify a storage location, and predict future demand. This way you can make sure you have enough in-demand products to sell to your customers, and thus increase customer satisfaction and product sales. Also, it helps to predict and allocate costs. Big Data Analytics is especially important in industries like aviation as there is no physical access to the testing environment. Tech hitches can’t be fixed by the cabin crew on the go and only in the biggest airports have maintenance teams. Thus, Big Data analytics solutions can predict the probability of a plane being delayed or cancelled due to technical hitches. Another important aspect is predicting aircraft engine parts failures as aircraft engine part replacements are among the most common and critical maintenance tasks in the aviation industry. Data Science and Big Data analytics are real game-changers for the transportation industry. They help to optimize routing and freight movement. Additionally, they help with fleet optimization and predictive maintenance through the real-time view of fleet operating conditions. Also, they help to optimize transit schedules by predicting the impact of maintenance, road-works, congestion and accidents. Big elevator companies provide a comprehensive service for millions of elevators across the globe. The major concerns are safety, reliability, and uptime. Predictive maintenance can provide the elevator companies with a competitive advantage in their service offering. Bio: Tetiana Boichenko is a marketing manager at N-iX LLC. She’s been working in technology companies for three years writing about emerging technologies like Data Science, AI/Machine learning, blockchain, and their implication for business.